Bringing the small Pixel into the now with a tall display and less wasted space, we have this year"s Google Pixel 3. Updated glass build and a couple of selfie cameras mark the other key changes compared to the 2017 vintage. 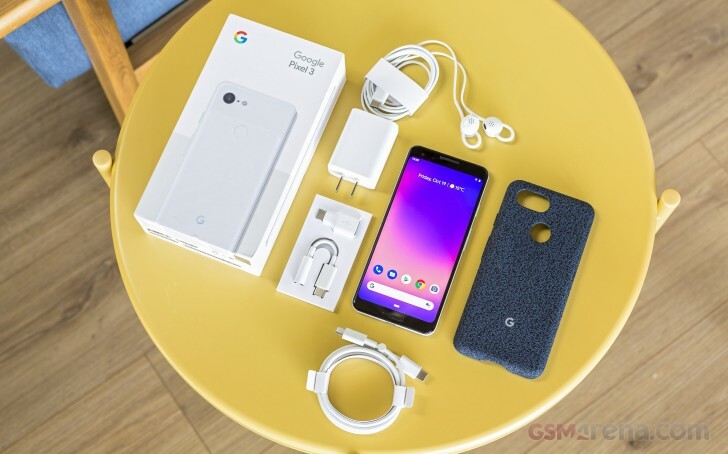 This being Google"s hardware vehicle for Google"s own software, the Pixel 3 comes with the latest Pie OS, almighty Assistant, and a main camera that makes up with machine learning and math for what it lacks in specs - an actual second module. Google"s aversion to the specs race continues and the Pixel 3 is one of few top-end handsets to make do with just 4GB of RAM and the 128GB storage maximum is where some current models start at. No memory card slot either - instead, it offers you unlimited cloud storage for a few years to come. Neat, but not quite the same thing, we reckon. The Snapdragon 845 goes without saying, and as with RAM, Google"s taken a conservative approach - clock speeds are lower than what you"d find on competing models. So be it. The slight increase in battery capacity to match the bump in display size is welcome, naturally, and so is Google"s continued effort to adopt and promote Power Delivery as the universal charging standard to rule them all. The addition of wireless charging, now that the glass back allows it, is also a nice development. Body: Aluminum frame, Gorilla Glass 5 front and back; IP68 certified for water and dust resistance. 145.6 x 68.2 x 7.9 mm, 148g. Just Black, Clearly White, Not Pink color schemes. Display: 5.5" P-OLED, 2160x1080px resolution, 18:9 (2:1) aspect ratio, 443ppi; HDR support. Rear camera: 12.2MP, Type 1/2.55" sensor, f/1.8 aperture, 27mm equiv. focal length (76-degree FOV), dual pixel PDAF, OIS. 2160p/30fps video recording, 1080p/120fps and 720p/240fps slow motion. Front camera: Primary 8MP, f/1.8 aperture, 28mm equiv. focal length, PDAF; Secondary 8MP, f/2.2 aperture, 19mm equiv. focal length, fixed focus. 1080p/30fps video recording. OS/Software: Android 9.0 Pie; Pixel launcher. Chipsets: Qualcomm Snapdragon 845: octa-core CPU (4x2.5GHz Kryo 385 Gold & 4x1.6GHz Kryo 385 Silver), Adreno 630 GPU. Memory: 4GB of RAM; 64/128GB of storage. Battery: 2,915mAh Li-Ion (sealed); Power Delivery fast charging; WPC(Qi) wireless charging; 18W charger in the bundle. Connectivity: Single nano SIM and eSIM; LTE-A, 5-Band carrier aggregation, Cat.16 (1.0Gbps/75Mbps); USB Type-C (v3.1); Wi-Fi a/b/g/n/ac MU-MIMO; GPS, GLONASS, Galileo; NFC; Bluetooth 5.0. Misc: Rear-mounted fingerprint sensor, front facing stereo speakers, Active Edge squeeze sensors. Sure, computational photography is cool and all, but wouldn"t it have been nice if there were a real telephoto cam, maybe? Yes, it would have been. Also, Google knows better probably, but we"d all have been happier with 6 gigs of RAM - if not even for futureproofing, then at least to look good next to the competition. Another of our usual complaints is addressed, sort of, inside the box. That would be the lack of a 3.5mm jack. To make you feel better about the missing port, the Pixel 3 comes with a pair of USB-C Pixel earbuds, a nice addition given the lack of a headset in the previous two generations. You"ll only be able to get to those after disposing of several layers from the inside of the plain white cardboard box that is unmistakeably Google"s. Remove the lid and the phone greets you from its tray. Underneath, a sleeve holds the documentation and the SIM pin, and covers another tray where the Pixel earbuds live. Get that out of the way and even more stuff shows up. There"s a USB-C to 3.5mm adapter and a USB-C to A adapter in a shared tray of their own, plus a USB-C to C cable. Another dedicated sleeve holds the charger - a Power Delivery unit rated at 5V/3A and 9V/2A. Mind you, the fabric case doesn"t come in the box - you need to buy that separately. Okay, with all of the peripherals accounted for, let"s focus on the phone itself.